The Notre Dame Baseball Skills Camp will provide campers with phenomenal baseball skills and drills. This fantastic three-day camp is perfect for all ages, regardless of skill level and experience. You will improve your game while having summer fun! The camp will be instructed by Notre Dame Baseball Coaches, as well as current and former Notre Dame Baseball players. You will receive personal instruction to advance your baseball fundamentals. Perfect for boys entering 3rd-8th grade! 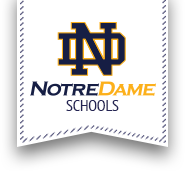 The camp will be held a Notre Dame Junior/Senior High School on Burrstone Road. The cost is $60 per camper or $50 per camper for families of 2 or more. Summer is a great time for baseball so don't forget to mark your calendar for the Notre Dame Baseball Skills Camp!